I have always been a picky eater, especially when it comes to vegetables. Now that I am a grown-up, I can handle eating vegetables when they are cooked (and smothered in butter, cheese or brown sugar), but I have a hard time eating veggies raw. Unfortunately, my kids are following my bad example. Years ago, my dad bought us Jessica Seinfeld’s book, Deceptively Delicious , which gave me some great ideas for sneaking pureed vegetables into all sorts of food. Most of the recipes that I tried worked great for our family and I even adapted some of our traditional family recipes. Still, I wanted to get my kids (and myself) to eat more veggies. Last February, I attended a green smoothie class with the ladies at church. In the past, I had experimented with tossing spinach into our infrequent smoothies, but at the class I got lots of new ideas. I decided that green smoothies would be a great way to get more fresh fruits and vegetables into our diet. My husband, who could easily live on raw vegetables, was excited that I enthusiastically started making green smoothies, but wondered if it would just be a phase that would wear off quickly. I am happy to report that February marks one year that our family has been faithfully and consistently drinking green smoothies. I make a smoothie nearly every night with dinner. For starters, my kids (and I) actually voluntarily eat veggies. We no longer have to beg, bribe, or force our kids to eat veggies. When mixed with yummy berries and fruit, who wouldn’t like raw spinach, broccoli and carrots? We eat a much greater variety of whole foods. Instead of choosing between green beans, corn, and peas as a vegetable side dish, we are eating things we’ve never tried before, like chard, beet greens, cabbage and kale. In addition to fruits and veggies we add in other ingredients that improve our health like coconut oil, flax seed and homemade plain yogurt. By changing our recipes, we are training our palates to like more veggies. When we started, we added more fruits, as well as some honey or agave nectar to be sure our veggie-haters would like the smoothies. We gradually added less fruit and more greens to the smoothies and the kids still love them. I am often impressed at how green of a smoothies thy will eat. I have noticed a difference in our health. We rarely get sick and we have more energy. I also feel better as a mom, knowing my kids are growing up eating healthy foods. I have had dishydrotic eczema on my hands since my first child was born. I’ve been to three different dermatologists and they all just prescribe a steroid cream and say there is nothing else I can do. Since adding regular green smoothies to our diet, the eczema, is almost completely gone. Green smoothies save us money by wasting less of our food. There are several ways we save money by wasting less. Don’t let is spoil– If lettuce starts to wilt, it’s not appetizing for a salad, but would be perfect for a smoothie. If you have more than you can use right now, stick it in the freezer. Frozen greens are perfect for smoothies. We had some oranges that were starting to get dry and weren’t very good by themselves. We took a few minutes to peel them all and put them in the freezer so they’re all ready for smoothies. Brown bananas (which you can often find discounted) aren’t just good for banana bread. Peel them and flash freeze them to add to smoothies later. Use it all– With smoothies, we waste less because we use greens and cores. After they’re washed, carrots and strawberries can go into the blender with their greens still intact. The core of fresh pineapple can be added to smoothies too. I just cut off the outside of the pineapple and slice the yellow fruit, core and all, to put in the blender. A little lemon or orange rind is good for you, too, but it has a strong flavor, so don’t use too much. Liquids– We save the liquids from our home-canned fruits to put in smoothies. When I rehydrate dehydrated fruits or veggies, I put the excess water into our smoothies. Water that veggies are steamed in also contains nutrients and can be saved for smoothies. Because we grow a garden each year, most of what we use in our smoothies are fruits and veggies we grow ourselves. Some smoothie ingredients from the garden include lettuce, spinach, chard, kale, beets, carrots, blackberries, raspberries, strawberries, zucchini, sweet potatoes, and pumpkin. All of these can be frozen in one way or another, so even in the winter we have garden foods for our smoothies. Smoothie ingredients can be frozen, so when we find great deals on in-season produce that we don’t grow, we stock up. We have apricot, plum, and peach halves that we flash froze and put into gallon freezer bags to use in smoothies. I really believe that by taking care of our health, we are saving money on healthcare costs in the future. Healthy eating and an active lifestyle are the best preventative medicine there is. Of course we are saving on our healthcare costs now, too, since we haven’t had to go to the doctor with any illnesses. My mother-in-law, who attended the green smoothie class with me has a nice Vitamix blender that could do all the things we learned about in the class. We just had a regular blender that we got second-hand, but I was determined to make it work for green smoothies. With a some adjustments to the recipes and avoiding fruits and veggies that would be to hard on the blender’s motor, we were able to have healthy green smoothies for nearly a year before the motor started to burn up. Impressed with my faithfulness in green smoothie creations, my husband surprised me with a Blendtec Total Blender for Christmas. If you’ve seen the Will it Blend? videos on YouTube, you know that they are amazing blenders! I am so excited to now be able to add even more raw foods to our smoothies that our regular blender couldn’t handle, like carrots, apples, and celery. One of the first things we noticed was that the seeds in the blackberries and raspberries are smooth. Besides smoothies, we have used our Blendtec for other frozen treats, soups, purees, whole wheat pancakes and even blending up powdered milk that otherwise is lumpy. It even grinds wheat and makes peanut butter! I love that the Blendtec is so easy to use and clean. It has programmed cycles for smoothies, whole juice, soups and more. You just press the button for the cycle you want and the blender runs for a set amount of time on different speeds. Of course you can also adjust the speed and time yourself if you prefer. All the Blendtec blender jars have straight, flat sides with no curvy, hard-to-clean crevices. The blade long and simple to clean around. Our old blender was a beast to clean thoroughly. My husband got a great deal on a factory recertified Blendtec blender and I couldn’t be happier with it. I can’t recommend it highly enough. We're banding together to pay off some serious debt in 2019! We want you to join in the debt-smashing fun! When you subscribe, you'll get monthly reminders to report your progress and you'll see how we're doing as a group! You'll also receive frugal inspiration and financial motivation in your inbox to help you along the way! 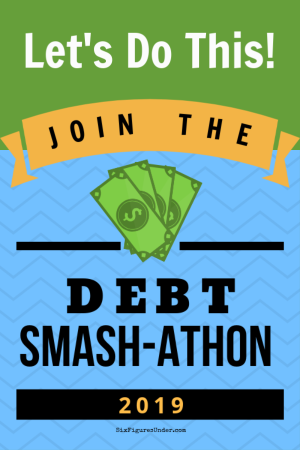 Are you ready to smash debt with us?! Love smoothies! My favorite smoothie is a handful of spinach or kale, 1 cup of light almond milk, 1 T of all natural peanut butter, 1 banana, and 2 t of pure cocoa. It’s full of protein and fiber, and it tastes delicious! That is funny Liz! I’m glad Franks helps you eat your veggies! I’m pretty plain when it comes to condiments. I don’t like ketchup, mustard, pickles mayo, etc. Just cheese! For me, it’s the texture of raw veggies that bothers me. With smoothies I don’t have to worry about raw veggie texture! Yum! Anything with peanut butter and chocolate sounds wonderful. I’ll have to give that a try. Thanks for sharing Kimberly! Stephanie, you are so right about saving your unused veggies for smoothies. I normally recommend eating the whole fruit/veggie, but if you have leftovers, freezing them will preserve their nutrients. No need to defrost them before blending, blend them frozen. Defrosting them will cause them to become mealy and fall apart. Your post is putting me in the mood for a smoothie! This is fabulous! Do you have any good recipes for using spinach? I love smoothies but HATE taking the blender apart to wash it after each use. And it is awesome that your kids already love veggies. Getting my younger cousins and niece to eat veggies is like asking them voluntarily do waterboarding. They hate it! Why Take the blender apart? It I practically its own washer! Fill with hot hot hot water and dish soap and whir around for 60 seconds. That normally cleans mine VERY well. That’s how we clean our Blendtec. It’s so easy and wonderful. Our last one wouldn’t get thoroughly clean that way. The glass had all sorts of weird grooves that were hard to clean and the part around the blade was hard to clean too. We never wanted to take it apart though, because we took apart the blender we had before that and after that it leaked. This is so true! We’re a family of 6 and I have to say, drinking smoothies in the morning for breakfast has saved us A LOT of money and plus it allows my kids to get all their veggies in without the fuss. SN: I love the way you have your debt tracked in your sidebar. I wanted to do that but my husband doesn’t want it public– I might add it anyways– it keeps you accountable, I think! Veggies without a fuss is worth a lot! Thinking about trying smoothies for the first time. Sounds like somthing I could use for a breakfast on the go (don’t like eggs). Got any recipes for someone just starting? Hi Angie! I think smoothies would be a great breakfast on the go. For just starting out, I would just put a handful or two of spinach into any other smoothie recipe you like. Spinach is one of the mildest greens. If will change the smoothie’s color but you probably won’t even notice a difference in the taste. Lots of great ideas here Stephanie! I use a mason jar with my blender to make protein shakes, etc. Put ingredients in, screw blade and ring from blender on, and zap it up. Then I can rinse off the blade contraption quickly. I drink the shake out of the mason jar and then it is going into the dish washer – no cleaning a blender and a cup! Also, if I want the shake for later, I just screw on a regular mason jar lid. One of the things that kept me from making morning shake/smoothies was the pain in the toosh of cleaning the blender. Since I can a lot of my garden produce, I usually have lots of mason jars around. I’ve never heard of using a mason jar. That’s interesting! I know what you mean about cleaning blenders being a pain though! That’s what I hated about our old blender. Our Blendtec is super easy to clean and I love that about it. It’s also nice a big, which is great for me since I always make smoothies for all 5 of us! My #1 Garage Sale Pet Peeve-- Don't Make This Mistake!